Looking for more power from your diesel truck or car? Consider an EGR delete kit. Benefits include lowering engine temperature, better fuel mileage and increased horsepower. Before you jump over to Amazon and buy one, let’s talk about what an EGR valve does. 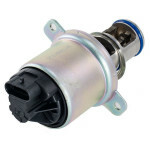 The exhaust gas recirculation (EGR) valve is an integral part of the emissions control system in your vehicle. It helps reduce the amount of Nitrogen oxides produced by the engine at extreme operating temperatures. Many gearheads – especially diesel truck owners – have found that by removing their EGR they see instant performance gains. What is an Exhaust Gas Recirculation Valve? First, EGR stands for Exhaust Gas Recirculation. 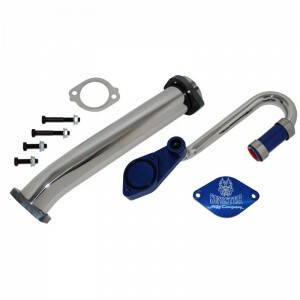 It is designed to redirect exhaust gases back through the engine intake to reduce emissions and harmful pollutants. The system reduces oxides of Nitrogen (NOx) that are produced during the combustion cycle. The high temperatures in the combustion stroke are the perfect environment for nitrogen and oxygen to form oxides. This happens at temperatures above 2500 degrees Fahrenheit. An EGR valve is designed to lower combustion temperature and prevent the formation of oxides that are harmful to the environment. The EGR valve lets a measured amount of exhaust gas back into the intake manifold. The exhaust gas will not burn, but instead takes up space in the cylinder and reduces the amount of available oxygen and fuel to be burnt. Editor’s Note: EGR delete kits are intended for off-road use only. What’s Included in an EGR Delete Kit? A typical kit includes an EGR block-off plate, EGR cooler block-off plate, up-pipe assembly, as well as replacement gaskets and bolts. It’s no surprise that EGR delete kits have numerous glowing reviews on Amazon. After all, an aftermarket kit is an inexpensive way to increase performance, improve gas mileage and extend engine life. One satisfied Amazon customer, Paul W., left a 5 star review and highly recommends the kit. He also mentioned that, “The installation of Custom Diesels EGR delete kit went smoothly. Everything matched up perfectly and couldn’t be happier with their delete kit. I have recommended this product to others. 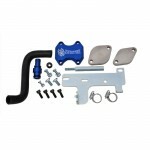 Another 5 star review from Jason B. confirmed that this kit is easy to install and very reliable. 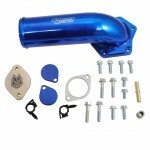 He said, “I put this on my ’03 Ford F250 6.0L and it fit and works great! I’ve had it installed a year now with no problems.” We’re glad to hear when everything works as it’s supposed to. Finally, Amazon reviewer, Jordan, left a comment and said “I installed this kit on my 2004 6.0 and am very satisfied. All in all, I would definitely recommend this kit.” To put a cap on his recommendation he also gave the EGR delete kit a 5 star rating. You can’t beat that. Not only does an EGR delete offer a long list of performance advantages but it also comes in an affordable package. Some of the most common reasons to remove an EGR valve are to increase horsepower, lower engine operating temperatures and improve fuel efficiency. The best part about buying one of these kits online is that you can get free shipping and install it yourself within a few hours. While some manufacturers recommend having a professional install it for you, it’s not impossible to do it yourself. How Does an EGR Delete Kit Work? An exhaust gas recirculation valve, more commonly known as EGR valve, is used primarily for reduction of NOx emissions, so this is an emissions control device. There are some negatives to the EGR system though, as excessive use of EGR results in soot in the intake system which can lead to short term failures and potential long-term issues as well. The EGR delete kit is legally only allowed for off-road use trucks, although you can be sure that many on-road trucks also use the EGR delete kit. A common EGR kit comes with 2 pipes, a pipe with that essentially serves as a plug for the normal EGR return route, and a straight pipe that replaces the EGR cooler. The other trick is that for many modern vehicles using EGR, failure codes are in place to detect the presence and accuracy of the EGR flow. In case of using just the delete kit, the engine light may illuminate, and the overall performance may suffer. For this reason, many people would then need to additionally of the ECU programmed with a tuning kit to ensure optimal performance without the EGR installed. For the advocates of the EGR delete kit, the claims are that the EGR delete kit will improve gas mileage and make your engine run longer. These delete kits are primarily available in diesel engines where the percentage of EGR flow is much higher than for a gasoline engine. Recent improvements in gas engine EGR systems have actually shown the ability to improve fuel economy performance. For diesel engines, it is true that the engine without the EGR system is capable of having better fuel economy, but those results may vary based on the calibration of the engine. The increased engine life is also directionally correct, as recirculating soot to the intake system is probably never a good thing, but a blanket statement of improving engine life may be difficult to prove as there are so many other potential problems with an engine. The size of the delete kit depends on the engine it is replacing, but it should be roughly the same size as the EGR system that it is replacing. For North American markets, as mentioned before, this is primarily seen for diesel engines, and the majority of North American diesel engines are greater than 6 liters. The overall weight of most EGR delete kits is normally less than 5 pounds. The EGR delete kits are made of aluminum and stainless steel, products more resistant to rust in this type of environment. While the EGR delete kit can be replaced at home, it is important to have some experience working with engines before venturing into this. In some cases other parts will need to be removed, and in all cases the installer will need to ensure the proper torque is applied. If you are not familiar with this, many custom shops will do this. Another potential reason for a custom shop is that the engine will also need to be tuned for this modification. Extreme caution is recommended before deciding to do this, as this will greatly increase the NOx emissions and as a result the car is no longer emissions compliant. This could result in a great deal of hassle, and in general is not the right thing to do for the environment. Another reason to proceed with caution is that this modification will likely void any manufacturer’s warranty. The EGR delete kits are becoming more popular, and likely this is especially among those who have had bad experiences with EGR systems in the past. There will be some gains seen, such as a slight improvement in fuel economy, and would reduce the number of parts that could fail, i.e. EGR valve being stuck would no longer be an issue. Prior to using this, I would recommend to proceed with caution, as you are increasing NOx pollution, and if this is to be used for on-highway applications then your vehicle would no longer be legal.